Buying a gift for someone with a hobby (or obsession, depending on your point of view) seems like it should be easy. But then you see how much stuff there is available within that particular hobby, and start questioning what they might need, what they’ve already got, and what might be fun and impressive to them. Pretty soon you’re stuck in total option-lock, and you end up getting a gift card. Lame. To help you avoid a similar conundrum with the griller in your life, we’ve put together a list of some of the coolest, craziest and best grilling gifts in 2019. And if you’re buying for yourself, you might come across some must-have bbq gift ideas you never knew you needed until you see them below! The Looftlighter is the brainchild of Richard Looft, a former Swedish actor, and director. 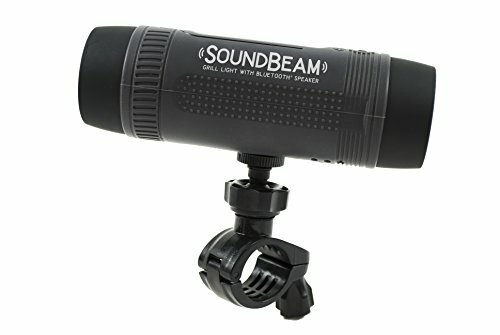 It looks like either a shotgun microphone, or a curling iron, but it’s actually a super insane lighter for charcoal and kindling. Honestly, you’ve never seen anything quite like this (unless you’ve already seen it). What’s not to like? It ignites a pile of charcoal in about 60 seconds without making a mess or using any lighter fluid. Lighter fluid can taint the flavor of your meat – it is evil and should never be used for a cooking fire. It is well thought-out and engineered and includes a built-in stand to protect whatever surface you put it down on. It uses forced air blown over a heating element to cause combustion of paper, kindling, and of course, charcoal. It weighs just two pounds but heats air to more than 1250F. Watch the video: it’s impressive as hell. Yeah, and it’s also got a bottle opener in the handle. Take my money. How have I ever lived without this? Does he always carry a beer in his back pocket? Where did the bottle cap go? A chimney starter can really speed up the painstakingly slow process of igniting your charcoal. In a nutshell, you load the metal cylinder with briquettes or lumps, load the bottom with newspaper and set the paper on fire. The chimney action draws up the heat and gets the briquettes blazing in short order. Once lit, simply dump them in your barbecue and start grilling. The Chimney of Insanity has a 90-degree elbow air intake. It’s a bit like having a jet engine in that it forces air into the chimney with greater power, and that speeds up the ignition. Wouldn’t you rather spend less time lighting so you can eat sooner? We also like it because it has a dragon on the outside, and the name reminds us of the Cliffs of Insanity from The Princess Bride. That may not have been intentional on the part of BBQ Dragon, but it’s still cool. A compact, portable fan for helping to speed up charcoal ignition. Just clamp it on to the edge of your grill, aim it towards the embers, and turn it on. Just like a set of bellows – we used to use a Frisbee when we camped – the blast of oxygen fuels the fire and gets it roaring in no time. 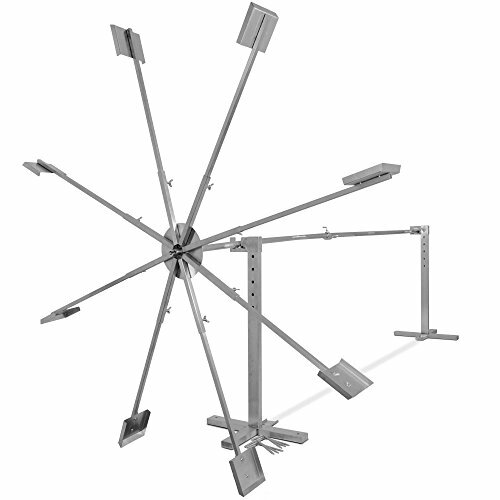 The combination of clamp and flexible arm makes it super-versatile. You can even use it in conjunction with the Chimney of Insanity above for, uh, extra insanity. It also works for firepits, fireplaces, chiminea – anywhere you’re trying to get a fire going. Since it’s battery-operated, you’re not limited by the length of your cord. If you use rechargeable batteries, you can recharge them with a USB hook up. Anything that gets us closer to enjoying some good barbecue more quickly is cool in our books. 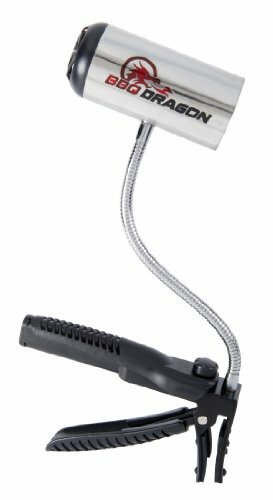 AKA The Smoking Gun, this is the fastest way to add a mild smoke flavor to your food indoors. You put your combustible material in the chamber – Breville says you can use wood chips, tea leaves, dried herbs or spices – light it up, and switch on the fan. Pretty soon you’ve got scented smoke blasting from the nozzle. It’s a bit like one of those steam-blasting fabric de-wrinklers they have at some clothing stores. Although there’s no substitute for a real smoker running for hours on end, sometimes fast and easy is ok. It’s especially great for someone who lacks the space, or even the interest, to own a full-size smoker. This is a fun and simple way to add a touch of smoky flavor to almost anything and deserves a place as one the best bbq gift ideas – even if it’s not truly BBQ related – because I guarantee it would be loved by any griller in your life. Meat claws are basically large forks that allow you to tear into meat with far greater control and considerably less effort. Anyone who regularly makes pulled meat really should have a pair. We like anything that makes our life easier, and these totally fall into that category. Half the battle of making pulled pork (or any pulled meat) is pulling it! Using a pair of forks can be tedious and hand cramp inducing. Each claw is a single piece of BPA free durable plastic and should stand up to regular and rugged use. This is probably the simplest way to get evenly pulled meat every time. Dressing up like Wolverine while you use them is a matter of personal choice. 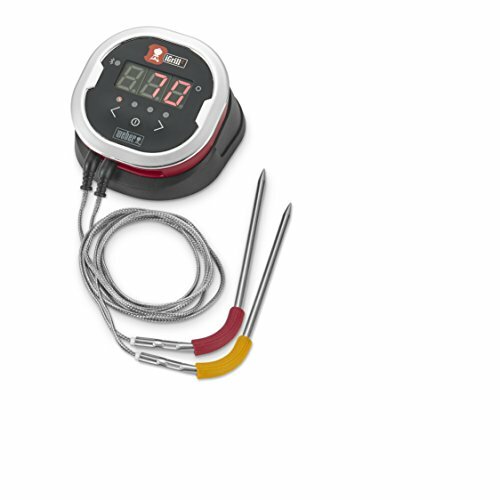 A high appearing entry in our roundup of the best available wireless meat thermometers, the iGrill2 is a dual-probe digital thermometer for monitoring the internal temperature of your meat as it roasts or smokes. 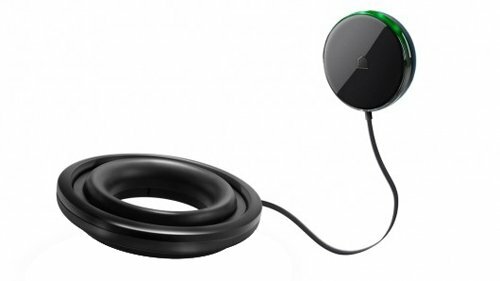 Connect via Bluetooth to your smartphone and use the free app to keep an eye on things from up to 150 feet away. By purchasing additional probes, you can connect up to four at once to monitor four pieces of meat at one time from a single unti. First, it’s from Weber, so we know it’s a quality piece of equipment. Second, we love being able to keep a virtual watch on our meat without needing to hover around the grill constantly. Go enjoy the party! The app will give you a notification when your meat is ready. No smartphone? No worries! It’ll still give you an accurate temperature reading right on the base unit. Claimed battery life is 200 hours. That’s a lot of smoking. 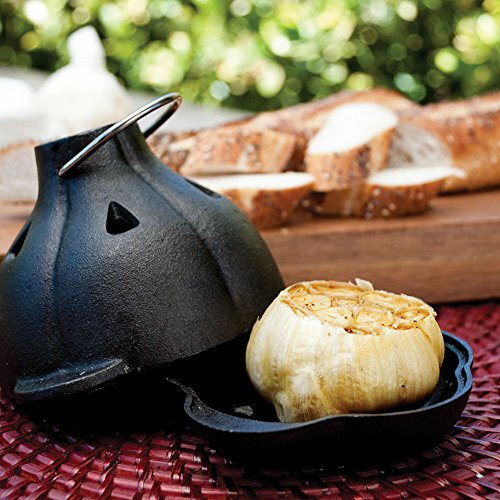 Made of cast iron, this garlic roaster is shaped to hold one or two garlic bulbs. Pop in the garlic, and slap the roaster on the grill for beautifully roasted garlic to add to your meal. The silicone squeezer makes it easy to remove the roasted garlic from the bulb. If you’ve never tried roasted garlic on your meat, or spread on a crostini with some cheese, you really don’t know what you’re missing. It’s so soft you can spread it with a knife. Having a dedicated roaster protects the garlic from your grill and makes it a piece of cake just to set over indirect heat and leave it while you tend to other things. The cast iron looks great, and you should get years of enjoyment out of your roaster. 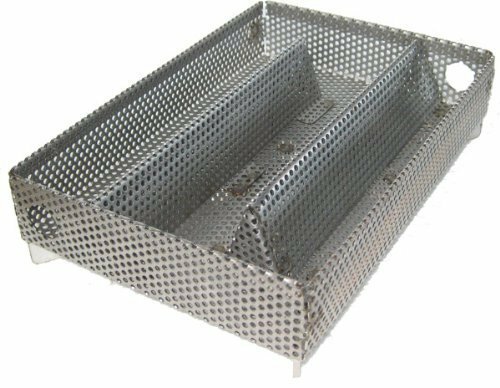 Add extra smoke to your food with this stainless steel pellet or sawdust basket. It’s meant for generating smoke for cold smoking, but also works for hot smoking too. 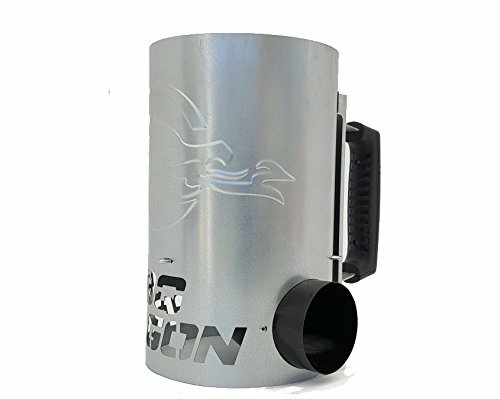 You can use it for supplementary smoke in an electric smoker – which don’t always smoke well at low temperatures – or with most other grills to add some smoky goodness. It’s lightweight and portable so that you can use it anywhere. Take it camping, if you like! This is the ideal way to add some smoke even without a smoker. Fully loaded, it can smoke for up to 12 hours, which you’ll need if you’re cold smoking. For anyone thinking about cold smoking, this is a great gift. Protect your clothes from grease, and your dignity from embarrassing novelty aprons with a serious, high-quality apron. This one is made from heavyweight cotton and has metal grommets and rivets. Pockets in the front will keep you organized, and the size is adjustable. So help us, if we see one more bikini body apron, or “funny” phrase about grilling or beer, we’re tossing that thing in the firepit. An apron should be functional, not funny. That’s just our opinion, of course! There are many good aprons available, but this one has the best combination of features we’ve found. It’s very durable, but because it’s made of 100% cotton, it still breathes. You’ll be much more comfortable in this than a leather apron. We also love the crisscross straps and buckle release. You’ll be able to load up your pouches with gear, but not feel the weight of it on the back of your neck. 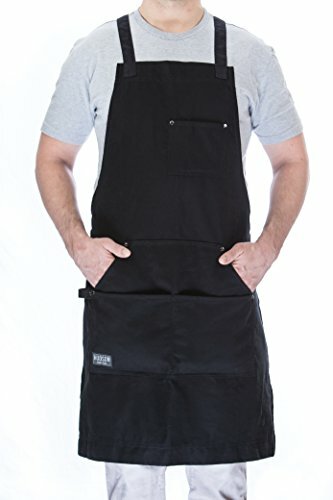 One of the best grilling gifts you could possibly buy for any messy grillers in your friendship circle, An apron like this should be part of every grillers essential equipment list. 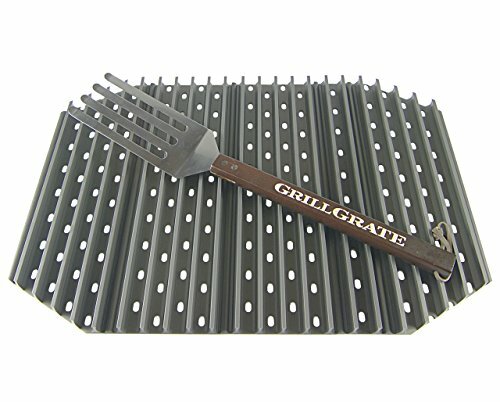 The grill grates are the center of the action on any barbecue. They are perpetually subjected to temperature extremes, grease and other fluids, and scraping and cleaning. In short, they take a severe beating. Good grill grates are essential to good barbecue, so if you or your intended recipient has substandard (sometimes stock grates aren’t that great) or worn out grills, new grates are an excellent investment. Just make sure you get grates you know are going to fit correctly. Ill-fitting grates are annoying as heck. It’s a little robot minion whose only task is to bounce around your barbecue cleaning your grill. No seriously! Grillbot is a bit like a child’s bump-n-go toy that changes direction when it hits something. 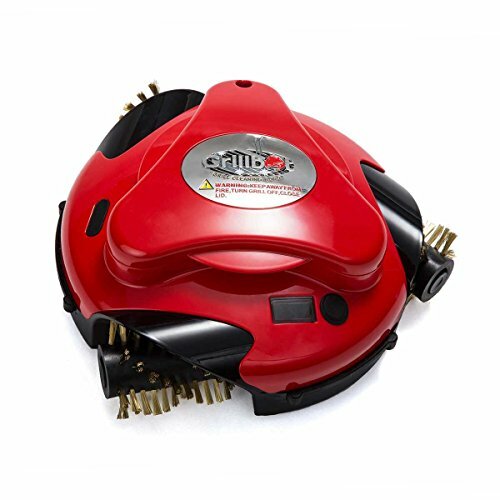 Unlike a toy, Grillbot has three rotating brushes that scrape away at the crud deposits on the grill. It just keeps on going and scraping until you turn it off. Ask 1000 grillers what their least favorite part of grilling is, and we’ll bet a lot of them will tell you it’s cleaning the grill. How nice would it be to have it taken care of for you while you eat, drink, and, uhh… clean up everything else? When will there be a robot for that?? Sure, it’s a bit of a novelty item, but there’s something about a robot servant that speaks to our inner geek. Is this the coolest yet nerdiest BBQ utensil on the market? You be the judge! 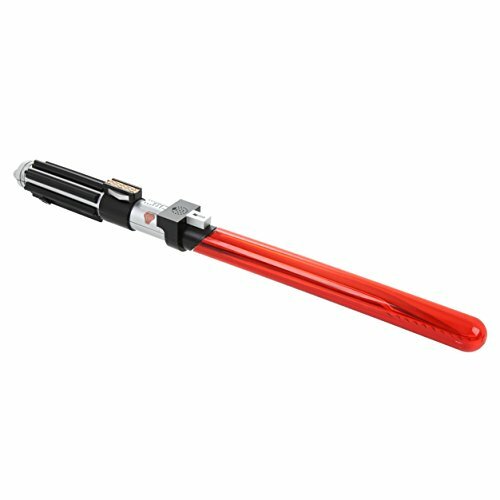 Quite simply, it’s a pair of unremarkable tongs that just happens to look like a lightsaber from Star Wars. Oh yeah, and it makes lightsaber sounds, too. You have to have a pair of tongs when you barbecue anyway, so why not make them cool? On a practical note, we do like how they slip into a sheath between uses. This keeps them clean and ready for use at a moment’s notice! At least, that’s how we’d justify buying a pair. Are there better tongs on the market? Yes. Are there cooler tongs on the market? No. May the Roast be with you. Make gourmet burgers stuffed with cheese, sauce, bacon, peppers, or whatever takes your fancy. It can shape patties like an ordinary press, but it’s designed to go one further and allow you to stuff the center of the patty with ease. Stuffing anything into ground meat is devilishly tricky to do without the right tools. This simple device makes it a piece of cake. 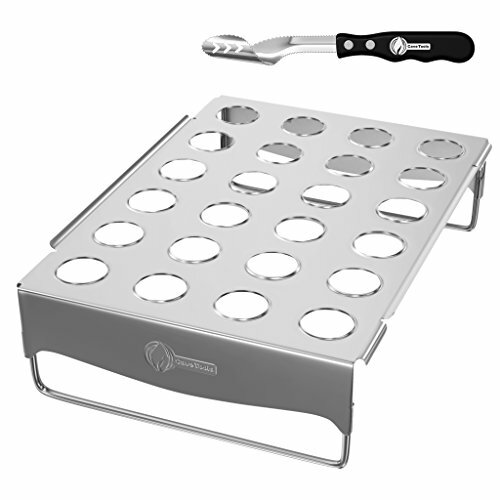 You can also use it for sliders, making it a true 3-in-1 grilling gadget. It has a non-stick coating, so your burgers will pop out intact every time, and it’s dishwasher safe, too. 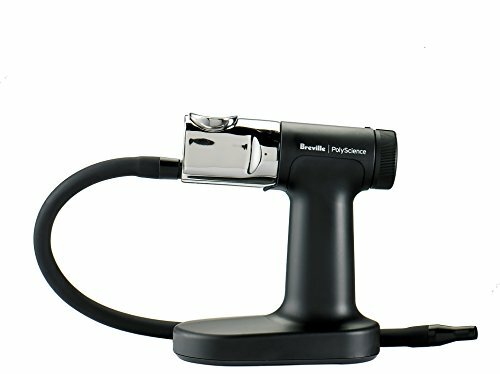 If you or someone you know is crazy about burgers, this is a must-have tool. 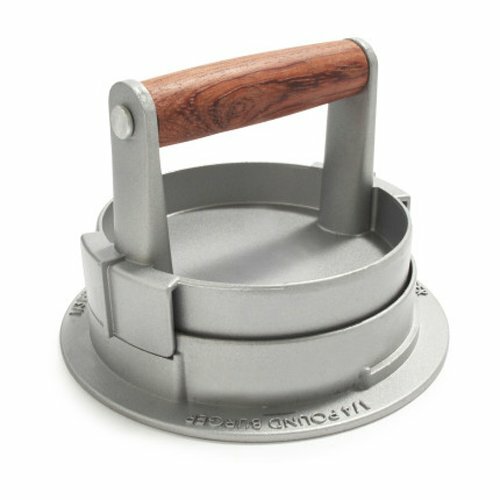 If you think a burger doesn’t need anything inside except more meat, this solid, attractive, and functional burger press may be the one for you. It’s made from cast aluminum and has a rosewood handle – all in all, a pretty attractive piece of equipment. Since it’s made of metal, it feels more robust than units made of plastic. We appreciate how simple it is to switch between ¼-pound, ⅓-pound, and ½-pound patties. With a non-stick surface, making perfect patties should be a breeze. This lightweight light clamps onto your BBQ lid handle so when you peek inside, you can see how things are progressing. Unlike any other units we’ve seen – and there’s plenty in our best grill light buying guide – this one also has a built-in Bluetooth speaker, allowing you to stream music while you grill. Grilling at night can be a challenge if you don’t have good backyard lighting. Being able to see clearly when you lift the lid can mean the difference between medium-rare and medium-ruined. Its single light is low-profile compared to some bar-style lights, so it’s unlikely to get in your way. And since you’re likely to be standing outside alone BBQing at night, you’ll love the Bluetooth speaker for throwing on some tunes from your phone, or connect to your indoor Bluetooth-compatible system and stay connected to the party while you’re manning the grill. These metal baskets are designed to hold most standard-size kabobs for easy grilling. Build your skewers, close them inside the holders, and place them directly on the grill. The baskets clamp shut, and won’t open when you turn them over. Kabobs are notorious for sticking to grills and falling apart when you try to turn them over. Using these individual holders prevents sticking, and makes it easy to turn your kabobs over for even cooking. With a set of these, there should be nothing standing between you and perfect kabobs every time. 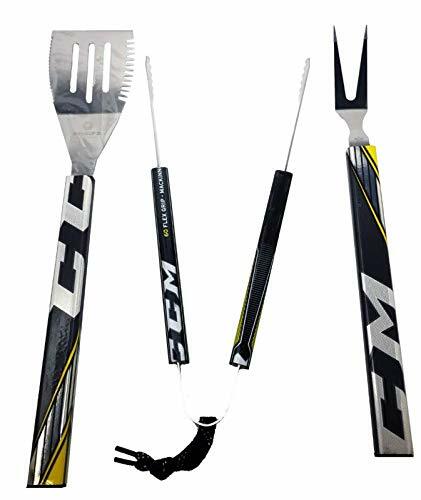 Actual broken carbon hockey sticks upcycled into BBQ utensils. Each set comes with tongs, a spatula, and fork. They’re made by two guys who saw treasure where everyone else at the rink saw only trash. Upcycling is a great way to keep stuff out of the waste stream. (It’s also pretty cost-effective as a manufacturer if half your material is garbage.) 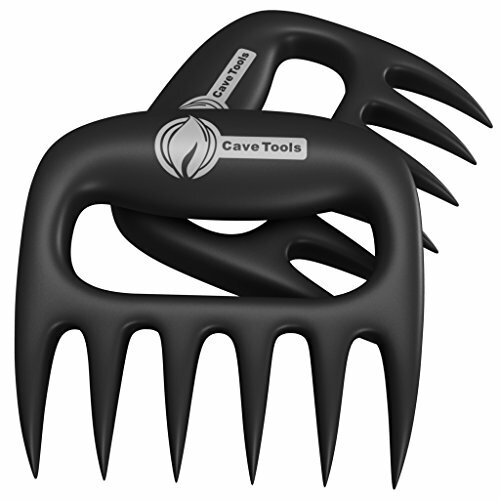 Everyone needs BBQ tools, so why not choose ones with style? If you’ve never held a hockey stick before, you’ll be impressed with how good this feels in your hand. The carbon is very light, but sturdy, and meant for gripping. They’re a great and novel gift for your sports fanatic grilling friends or any Canadians you might know. And yeah, that’s a bottle opener on the end of the spatula. Freaking amazing. 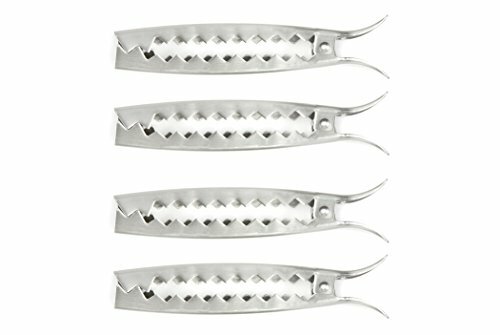 A set of 4 stainless steel clips designed to hold vegetable sticks on the grill for easy roasting. Man cannot live on meat alone, right? We love grilled veggies, but they can be difficult to corral on the grill. Grill clips will keep the little buggers where they belong. Load them up and then put the clips right on the grate. You’ll also be able to flip them in batches, allowing for even cooking, and negating the need to keep checking each individual stick. They’re pretty inexpensive, so we’re predicting plenty of bang for the buck. A connected scale that tracks how much propane you have left in your standard 20-gallon tank based on the weight of the tank. You use the free app to check the level, and you can use it remotely since the scale connects via Wi-Fi, not Bluetooth. Running out of propane is incredibly annoying. Wouldn’t it be nice to check on your level when you’re out buying stuff for your next epic barbecue? Now you can! We love the idea of not having to remember to keep tabs on our tank. Sure, it’s just a glorified scale, and yes, it’s only suitable for 20-gallon tanks. Since that’s pretty much ubiquitous for home gas grills, these aren’t significant drawbacks. It’s much more accurate than lifting the tank and judging for yourself. Yeah, you could buy a gauge, but you still have to remember to check it when you’re actually with your ‘cue. We’d rather not trust the success of our cookout to our iffy memory. Heat-resistant, waterproof gloves with extended forearm protection and a cotton interior. Meant to protect your hands and arms when working over a hot grill. We only very recently discovered these gloves, but will soon be adding them to our roundup of the best grilling gloves on the market. So many BBQ/oven mitts and gloves are too short and leave your forearms vulnerable to singed hair and painful burns. This pair extends more than halfway to your elbow for maximum protection. We also like that they’re gloves, not mitts, so it’s easier to get a grip on things. Speaking of grip, silicone is naturally grippy, but the textured exterior makes it even less likely you’ll drop whatever you have in your grasp. 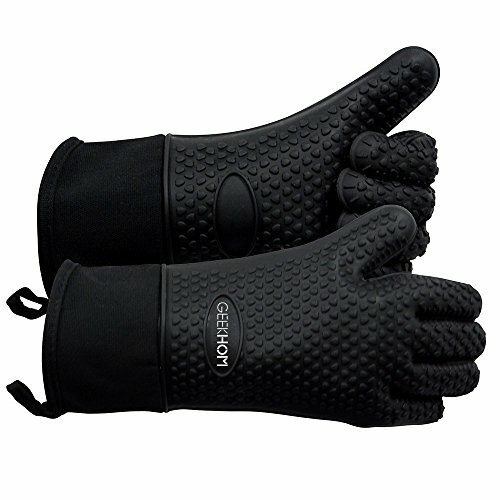 The gloves are rated for heat resistance up to 446F, and the cotton layer inside will wick away sweat as you work. 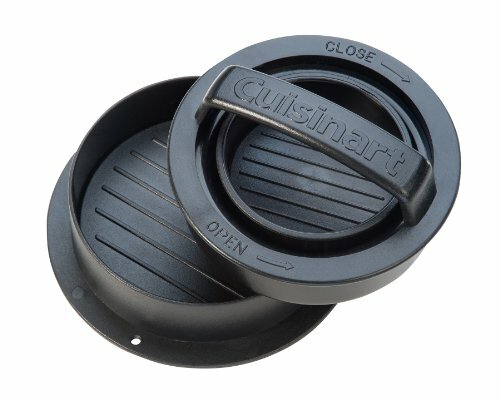 Highly recommended for anyone that uses skillets, baskets, or any other cooking device that needs attention on a hot grill. Convenient stainless steel rack with holes designed to hold jalapeño poppers upright and steady on a grill. Comes with a coring knife for removing the seeds and other interior pieces you don’t want to eat. Jalapeño poppers are such a great addition to a meal (good excuse to down some cold ones, too), but they can be tricky to grill. Without something like this, you’d have a heck of a time roasting them without just dumping the filling all over your grate. Each of the 24 holes will hold one big pepper. Clean up is easy, and we like that it comes with a coring tool. One clever reviewer used toothpicks to support undersized peppers from his garden. Necessity is indeed the mother of invention! Bonus Suggestion: Take the PGA challenge and down a popper after every hole next time you’re watching golf. 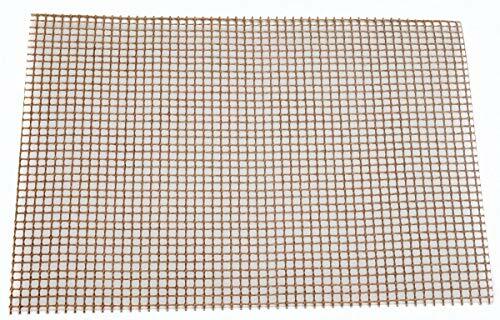 Sheets of wire mesh for cooking delicate foods right on the grill. They come in a variety of sizes – just pick the one that most closely fits your grill. Delicate items, like fish and pineapple rings, and small foods like shrimp and scallops, are brutal to cook on a grill. Standard grill bars are too widely separated to cook them, so you end up using foil. This has the unfortunate effect of blocking smoke and preventing grill marks and good browning. Frog mats will nicely support your most finicky food, but still allow full exposure to smoke and flame for maximum flavoring. They’re non-stick, so your whole filet will come up at once. You can even cut them to size with a pair of scissors. Seriously, everyone should have at least one of these. 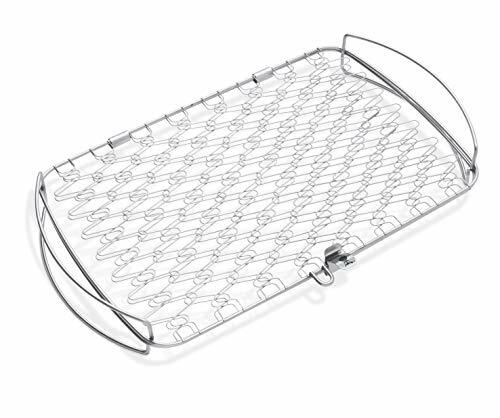 A stainless steel basket for grilling fish, vegetables and other delicate and otherwise tricky food. It’s made by Weber but will work on any barbecue large enough to accommodate its 18” x 10.5” dimensions. This is another excellent solution for grilling fish and veg right over the flames. Open it up, lock your food inside, and put it on the grill. That’s it. Nothing sticks to the grill, and it couldn’t be easier to flip your food for all-over grilling. True, there’s no handle on this basket, but that’s actually something we like about it. It’s too easy to forget that the handle is hot when it’s sticking out. When the whole basket is over the fire, you’ll know perfectly well you need gloves to pick it up. A steel water wheel with an attached rotisserie. Set it up over a fire near a source of moving water, and the water wheel will turn your meat for real rotisserie cooking without electricity. Let’s be honest here: the number of times you’re going to be cooking a whole chicken or a roast over a fire beside a moving stream is probably really close to zero. But, just imagine setting this bad boy up and harnessing the power of nature to cook your meat to perfection? Wouldn’t you go out of your way to make this work? Maybe even build a water feature in your yard? It’s not overly practical, but the concept does work, as proven by numerous YouTube videos. (Oh, and centuries of mills around the world.) We probably shouldn’t, but we can’t help but love this product – and we’d be happy to get one as a gift! 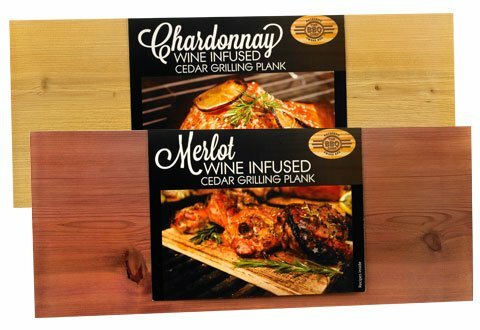 Cedar planks infused with wine (your choice of Chardonnay, Merlot, or one of each) for grilling. They are especially good for fish and impart a smoky flavor without a smoker. Even a plain cedar plank can make magic on the barbecue. Infusing them with wine makes it that much better. It’s not unlike using infused wood chips in a smoker, only you can use these on a standard grill. Planks serve the dual purpose of protecting delicate food from open flames and unfriendly grates. At nearly 14” x 9” there’s plenty of room for a decent size fish, or a whole bunch of chicken pieces, vegetables, fruit, or whatever you’re cooking. We’d go with the combo pack for more options. These will definitely be a favorite all summer long! 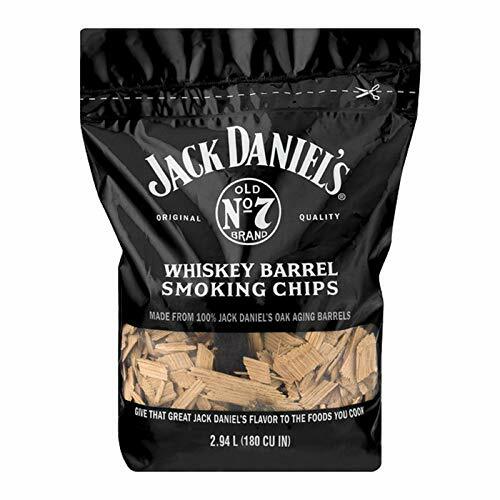 White Oak wood chips for smoking made from used Jack Daniel’s whiskey barrel staves. Use them for all your smoking applications to add some down-home flavor to your food. Pellets are also available for pellet smokers. There is absolutely no reason why a woman can’t enjoy a nice glass of J.D. in this day and age, and probably plenty do. But there is still something overtly masculine about Mr. Daniel’s brew, and smoking with chopped up whiskey barrels feels decidedly manly and bad@$$. From a practical standpoint, the chips still contain some whiskey and impart a nice flavor to your meat. We also like knowing we’re part of the recycling chain, as these venerable barrels come to the end of their useful lives. Ashes to ashes, or something. Oversized skewers such as you’d find at a Brazilian-style steakhouse. They’re meant for cooking and serving long, narrow cuts of meat. Just slice off pieces for a guest, and then carry the whole cut with you to the next person at the table. The Brazilian steakhouse experience is absolutely incredible. We love ordering slice after slice of gorgeous meat, gloriously displayed on sword-like skewers that look like they could have been used to kill the animal before cooking. We are totally in love with the idea of recreating that experience, even partially, in our own yards. To make it worthwhile, you need to serve multiple large cuts to a crowd of people – you don’t bust these out for an intimate dinner for two! 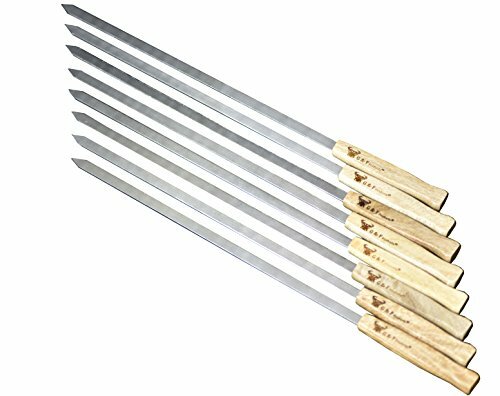 If that sounds like your bag, this set is ideal, with multiple, ½” wide, 17” long stainless steel swords ready for serving, each with an attractive wooden handle. If you want to know more about Brazilian barbecue, check out our article on Barbecue Styles Around the World. If you thought the only good grilling gifts out there were beer cozies and mildly offensive aprons, we sincerely hope we’ve helped you to see the light. There are scads of amazing products on the market, running the gamut from novel to indispensable. For more in-depth articles about grilling, smoking, meat, and accessories, take some time and browse around. There’s more content here than you can shake a stick at. Did we miss anything you think should be on the list? Do you have an experience with some of this gear you’d like to share? Please drop us a line in the comments below to let us know! Likewise, we welcome all your questions, comments, concerns, and even topic suggestions. Your input can only make us better. Thanks for reading, and have fun shopping! I want something to smoke cheese in. I want it as a gift so I don’t want to use a tin can.